I was in Study Hall today when one of my favorite grade two students came along. I had a cupcake that I had scooped from the staff room. I didn't have time to eat it at lunch so I was carrying it. My favorite grade two student asked me where I got the cupcake. There was a bakery box at the back of theroom with more cupcakes (likely the birthday boy or girl had taken a couple to the staff room to share with teachers and the rest were in the classroom). My guess is my favorite grade two student wanted one as well. FGTS: Where'd you get that cupcake? Me: I got it from the Cupcake Fairy. 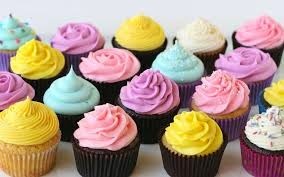 FGTS: The Cupcake Fairy? What's that? Various other children tell her: Don't believe her! She always teases. Me: (whisper voice) It's actually true. Don't listen to those jaded Grade 3 students. You know how Santa visits all the good boys and girls? Me: Well, the Cupcake Fairy visits all the good teachers. FGTS: But Mrs. Brown (names are changed to protect the innocent) doesn't have one. Me: (with an assuring nod) I know. I don't think we should talk about that. FGTS: (wide-eyed) Oooohhh. I see.